If you follow my Facebook page, I know you have been anxiously awaiting this pattern for a couple of weeks now 🙂 Thank you for all the great response and positive feedback from the sneak peek of this hat! 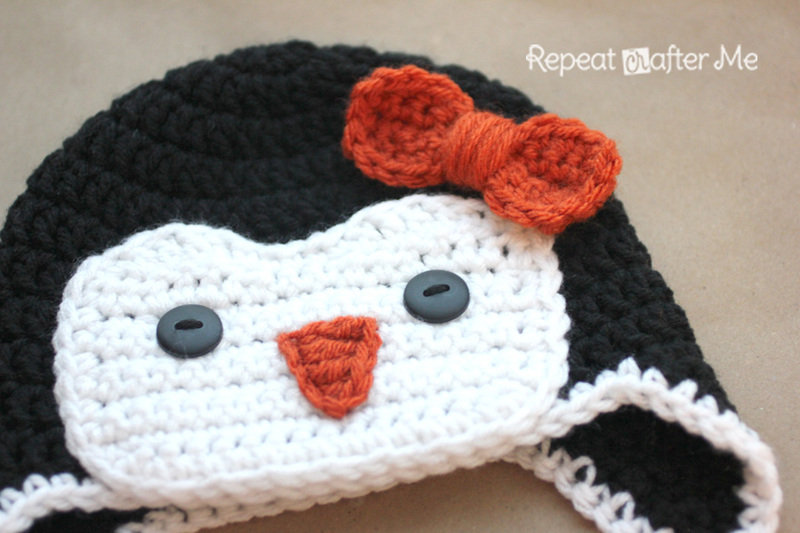 I am excited about this pattern because it starts with a new basic beanie pattern that is different from my Owl and Sock Monkey hats. I was noticing the top of the hats were becoming pointed with my other patterns and I believe I have fixed that problem with this pattern. I am looking forward to your feedback! Beginning at any point on the hat, SC around hat and earflaps, when you get to the top of each earflap: chain 40 (or as long/short as you wish), slip stitch in 4th chain from hook and the rest of the way down the chain. fasten off and weave in ends. Make two yarn pom poms, attach the pom pom to the bottom of the tails. Make sure they are secure by knotting them a couple of times. Trim ends to match the length of the yarn in the pom pom. Continue to SC around piece until you get to the beginning of row 10. Add a bow make this hat a little more girly! at the end of row 4, continue to SC around the edges, join to first SC, fasten off and weave in ends. Wrap yarn around the middle of the bow, tie off tightly and attach to hat. Love this! Also so happy you fixed the pointy tops! I have been using the owl pattern for all of my hats but had to wing it a little to fix the pointiness. Do you happen to have the measurements you use for each size? That would be soo helpful! 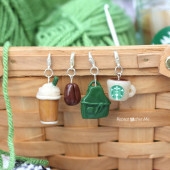 They are so cute, I'm going to start on them today thank you.I enjoy all of your patterns I think these are my favorites. thanks again. so cute!!! i could not resist and started already making one :)) thank you so much for sharing, i love them! Sarah, you are amazing and keep coming with the totally adorable patterns. Most kind of you to share them all! I can't crochet fast enough 🙂 Our little granddaughter is turning three next week and loves Minnie Mouse. I made her a hat from your pattern and can't wait to give it to her. Stoooop! showing me all those CUTE!!! hat patterns…I don't have enough time to make them all! LOL! I need to start on my sewing! My all-time favorite are the Gingerbread Men. I had to make 2 kids and 2 adult hats for my daughter's family Christmas photos. As soon as they are done I will send you a picture! You are sooo talented. Thank you and love you for sharing all these patterns! I seriously get excited to come check out your blog because you always have such awesome things for us. I'm a blog designer and have seen many, many, blogs and websites…yours is the ONLY one that I keep coming back to. 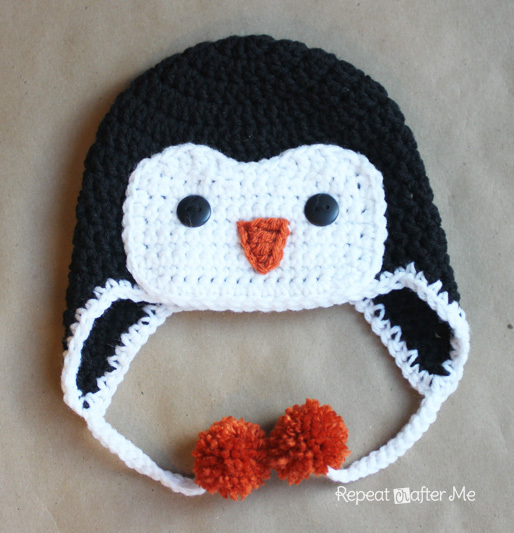 I love this penguin hat! I can't wait to get started on one of each for my little boy and little girl. Thank you for taking the time to share your talents with us! Oh I really love it! I have to find a kid who wants a hat! very sweettttt… i love this! i love your work! so awesome…. how many stiches do you put in your magic ring? is it 10, and then when you join it makes 11, so you can dc 11? Thank you for another fabulous pattern. I love it. I gave your owl hat as part of a baby shower gift. It was the hit of the shower. Now the Daddy wants one to match! 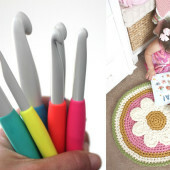 It's so awesome that you offer these patterns for free! Thank you, thank you!! I love it and am crocheting it right now 🙂 It only looks like the number of stitches between the earflaps aren't right? Your "magic ring" just changed my life. Thank you!!!! I love the new pattern without it being so pointy at the top. 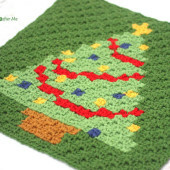 I am trying to make a beanie for my husband and would like to use this pattern. Do you know how to make a larger hat size then the teen/adult? Thanks so much! 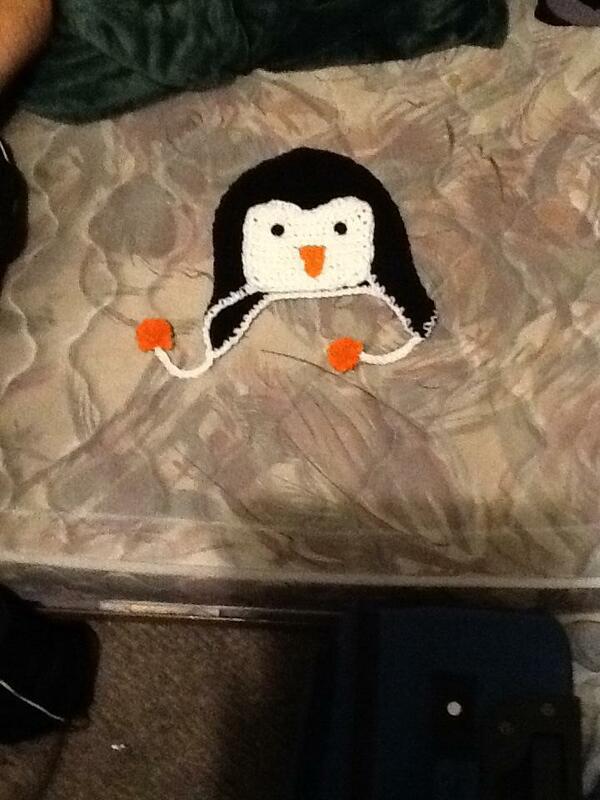 I have made about 10 owl hats in all sizes and then I went to make the penguin adult hat and it turned out WAY too big. I just ripped it out down to 60 stitches to see how that will turn out. this happened to me too. I tried doing the 9-12 month old and it fit my 5 yr old! lol. I crochet pretty tightly too. Does anyone else have this problem? this also happen to me. 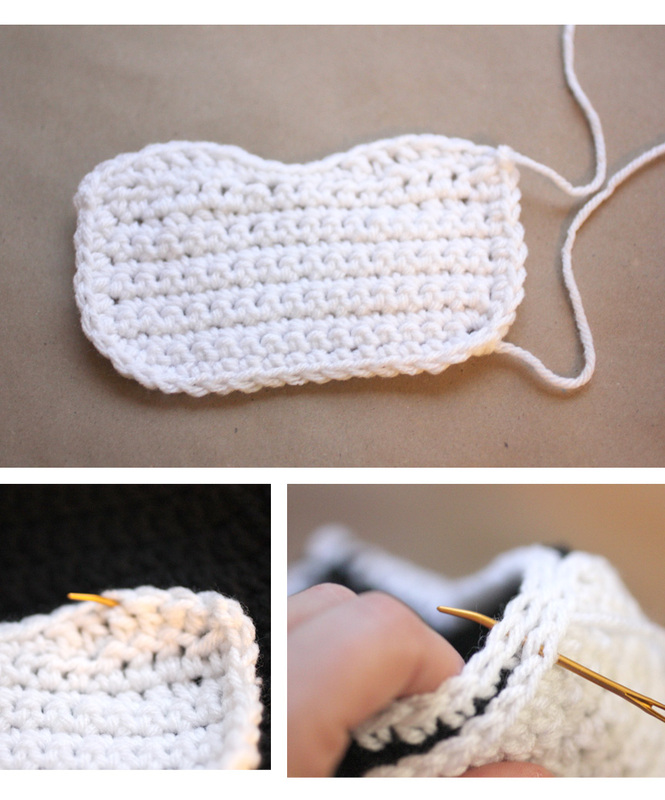 I am new to crocheting and I was hoping I didn't do something wrong. I still absolutely love this darling pattern! I'm having the same problem – my owl hats always turned out very small (I used dk rather than worsted yarn) so I got used to making a couple of sizes bigger than I needed. So I did the same with this, and have only just looked back to compare to the owl pattern and realise that the sizing has completely changed – 6-12m here ends up with 60DC all the way around, whereas for the owl pattern it was 50DC. Think I'll be frogging the last few rows…. I'm hoping my hat comes out the right size since I am using a slightly smaller hook. Guess I'll find out! These are absolutely just adorable! Thanks so much for sharing these awesome patterns with all of us! What a blessing you are! I made one of these for my niece for Christmas. I used fluffy white yarn. it turned out very cute. thank you for all that you do. I love your cute patterns. I'm in the process of making the hat, but when I add up the stitches on each row, I always have to add one more to make it right next to the chain stitch. I can't figure out what I'm doing wrong, I'm counting all my stitches, and starting in the same as my chain. Is this happening to anyone else? It still seems to be fitting my 2 year old, so far. Thanks for the free pattern! Your patterns are so freakin' cute. THANK YOU for making them free! I seem to have this thing against paying for patterns… maybe I'm convinced I could figure it out and save the few bucks (ha)… but free patterns are SO awesome, especially when they're good enough to be sold. 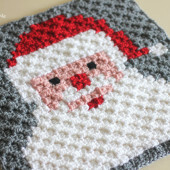 Hi Sarah – Love your patterns, posted my finished project on my blog. Thanks for sharing, I changed the bow just a bit but love the overall look, it looks like a penguin not an owl pretending to be a penguin. I love this pattern and have made a few already, but it seems the number of stitches to leave between the two earflaps isn't correct? Aren't there supposed to be more stitches between the earflaps? I'm just starting up my crocheting again, and with a little one on the way in November, it certainly wouldn't hurt to give a special little hat to the little pumpkin seed. Do you have a circumference chart, I made a 6-9 month hat and it fits my 18th month old daughter. Wonderful pattern!! 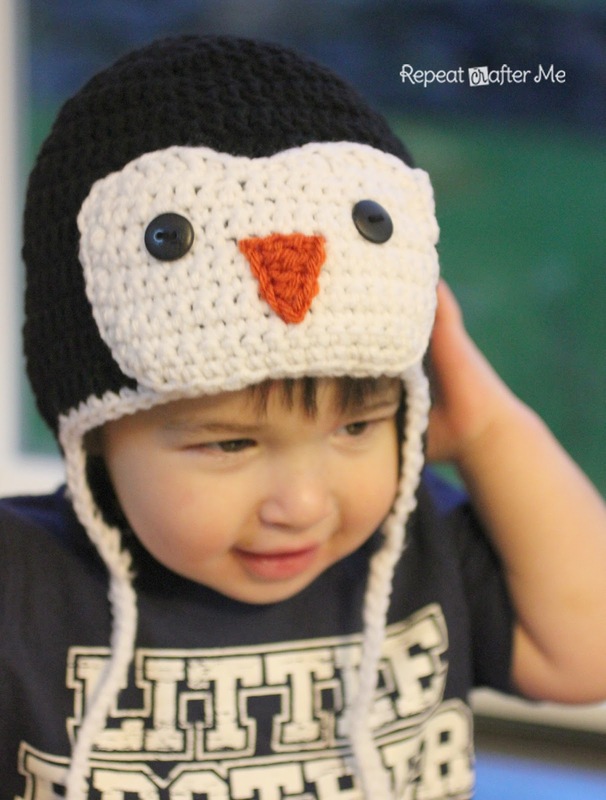 I made the 6-12m penguin and then used the basic beanie pattern to make a Zebra toddler one! I left one row off of the zebra hat for my daughter and it fits perfectly! Thanks again for yet another great pattern! Leave 9 stitches in front for newborn, 12 stitches for 0-3 months, 15 for 3-6 months, 19 for Preschooler"
It doesn't say how many to skip for the 9-12 months, I just did 17 myself. Your site is my very favorite when it comes to patterns. I love that you are clear and precise in your instructions. Thank you so much from this grandma who loves to spoil her grandchildren! I just wanted to let you know that I just love all the patterns you have posted and I follow them for EVERY hat I make. I also wanted to let you know that a women bought 4 of the girl penguin hats that I make and they will be worn at Sea World in CA with a girl scout troop. Very excited! Thanks again! Thank you SO much for this pattern! 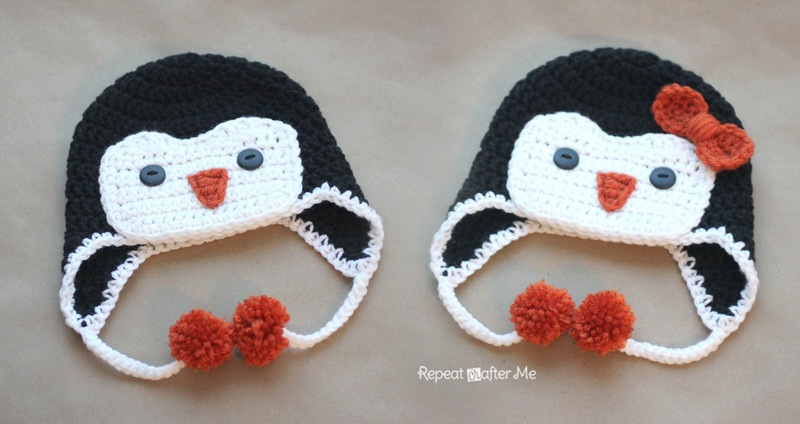 My sister-in-law is having a penguin-themed baby shower (not kidding), and I've been racking my brain on what I could make that was penguin themed. I've made your owl hat for a friend who loves owls (also her theme for her little one) and a Mickey Mouse hat for another friend. THANK YOU for sharing this. Love all your patterns, thank you so much for sharing them. You are one talented lady. I do have a question, though. I've made the "face" to use on an adult sized hat but it seems too small. I added a couple of rows, as you suggested, to make it longer, but it doesn't appear wide enough. Any suggestions? Thank you. I'm having a Secret Santa with a group of my friend and this is what the person I have is getting!! It was so simple and fun to make! Thank you for posting your patterns. They are such a joy to make. Easy to follow detailed instructions. I have had the pleasure of making several of them for my grands and great nieces and nephew and they love them. Again, thank you! 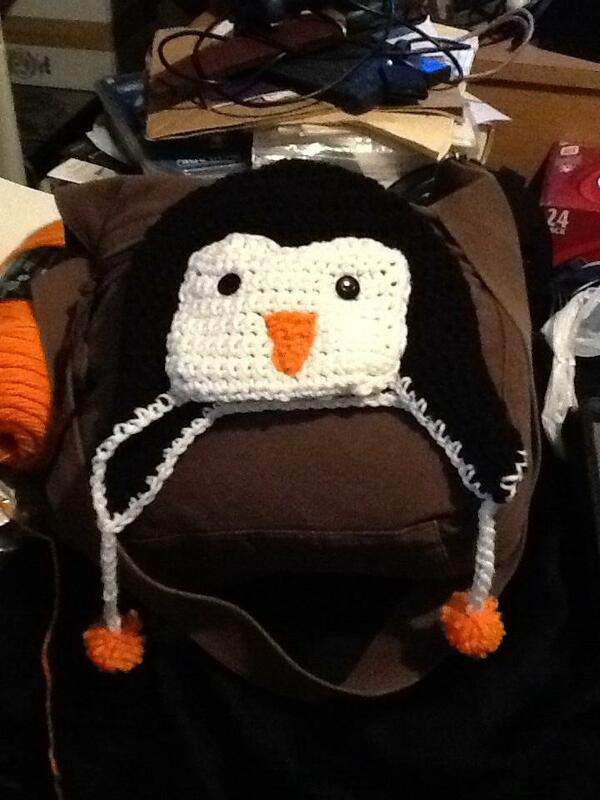 Finished the Penquin Hat and I love it. The Polar Bear Hat big hit with the family I gave it t for their baby and they posted a Picture on Face book. I sharedt her picture and entered your link. Thanks again so so much. Now on to adding the bits to the Monkey Hat. Then starting on Cupcake. Addicted to your Page. Vim convidá-la a ir no meu Blog e ver o Gorro que fiz do Pinguim, através de sua explicação, que está perfeita. Hi, sarah. I´m Ana from Spain. I have made your hat and link you, and I have made the pattern in Spanish. Thanks a lot!!! Kisses from Spain. ive made th hat and its great, but i dont know how to make the pom poms. Thank you for these adorable patterns! I find the sizes running very large though, the size 6-9m fits my 2 year old best, and she's an average size. It appears that I start making my ear flap at the back seam? I am not that experienced, but that doesn't seem correct. I do love your cute patterns and hope to continue making more. Thank you! I would like to make 5 of these in adult size, do you know how much yarn I need? Love the hat! Just made it! Thank you for the pattern!!! After the final round before the ear flaps..it says, chain 2..then you start the earflaps and it says chain 1, SC in next 10…etc etc..
Do I put the chain 1 (starting ear flap) right after the chain 2 (end of row 16)? Seems there will be a small loop? Or do I just chain 1 after the 48 DC on row 16 then SC for the flaps? Can you share the pattern of the snowman hat. The one thats red, grey and white. It doesn’t have the little hat on the top. Thank you. Sarah, I enjoyed making this hat for my Grandson. He’s going to dress as a Penguin for Halloween and it’s usually cold here in Michigan and I wanted to make sure he’s warm. His Mom loved the hat. Thank you so very much for your creativity and sharing of your beautiful patterns. Rows 3, 5 and 7 don’t say Ch 1 and turn, as do all the other rows. How can you not turn? I hope you can answer this. I’ve seen lots of questions and comments but no replies. Follow-up to my question. I was talking about the ear flaps for the 6-9 months pattern. Another great pattern! Always know that I can count on repeatcrafterme for easy to follow patterns. Have made many, many owls to go with every baby outfit or blanket I make. First time for the Penguin, it is going with the cocoon I just finished.